Share the post "Feeding Frenzy"
Each year about this time, I find myself on the proverbial soapbox regarding people feeding wild animals. I could tell endless stories about squirrels and the damage they have done to structures in and around Mason City. Many articles have been written about how some creatures adapt as well as grow in numbers when living around humans. People with bird feeders work hard to keep the squirrels out of their feeders yet many times they find a way to get at the feed. They also feed on what the birds have dropped on the ground. Too many times I see people with squirrel feeders in their back yards. I’m sure the neighbors don’t like that too much as it creates an invitation for others to come and enjoy the feast. Not long ago, I discovered a dead Jack squirrel in a vacant home that evidently managed to get into the home via the dryer vent. Some squirrels go absolutely crazy when trapped in a home they’ve entered. Many years ago, a classic one-of-a-kind custom built home was invaded about a week before the closing was to take place. It evidently entered the home by climbing down the fireplace chimney. That particular home had some of the most gorgeous oak woodwork. From the time it entered the home and up to the time it died, it chewed nearly every window pane and sill it could get at. The seller spent thousands of dollars in repairs before the sale closed. One particular owner who had many oak trees surrounding her home had to have five large oak trees cut down to create enough open space between her home and the tree branches. The squirrels were relentless with their jumping from branches onto her roof and making entry holes in the attic overhangs. Once they learn that attics are much cozier than their hollowed out tree homes, they become aggressive in attempting to take up residence in a man made structure. 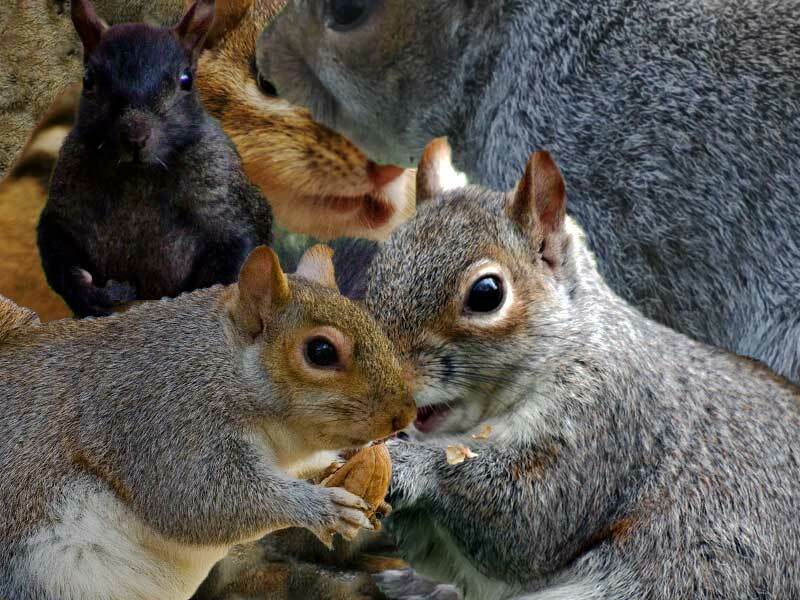 Several years ago, one of my clients was down on the ground painting the foundation of his home which was located in an area highly populated by squirrels. I was shocked when he arrived at the office with his face all scratched up by a squirrel that was evidently fighting with another squirrel close to his home. It seemed the squirrel must have thought he was part of the house and raced over his face in the process. By the look of the scratches, squirrels have sharp claws and know how to use them. Let’s keep Nature natural and refrain from creating areas where the squirrels go into feeding frenzies.